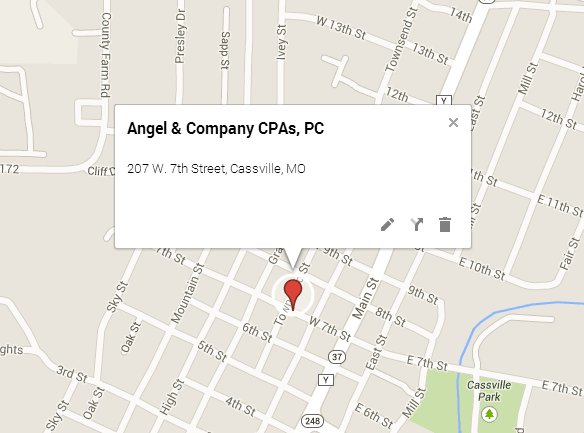 Angel & Company CPAs, P.C. *Unfortunately, Google Maps does not direct you to our exact location. If you are coming from Main Street, our building will be on the right, at the corner of W. 7th Street and Townsend Street. We are working with Google to fix the error, and we apologize for the inconvenience. When you need a certified public accountant or business valuation expert, look no further than Angel & Company, P.C. Our more than 30 years experience is ready to work for you! To be our clients' most trusted business advisor. Each client has unique needs, situations, and goals. We will listen to you and help create specific solutions that are designed to meet your needs and to help you prosper. As stated above, our mission is to be our clients' most trusted advisor for tax, accounting, and business matters. We are proud of the way we have impacted the quality of life of the families and businesses we serve. Whether you need income or estate tax services, business accounting services, Quickbooks consulting, or business valuation services, we are committed to providing you the best sound, creative, and confidential guidance. Let us help you with your finances! Call 417-847-3177 or visit our office at 207 West 7th Street in Cassville.